A new channel has started in DVB-S Clear: Bethel Television (Peru) on 10815.08MHz, pol.H SR:27485 FEC:5/6 SID:43 PID:835/1091. A new channel has started in DVB-S Clear: Bethel Television (Peru) on 10815.08MHz, pol.H SR:27485 FEC:5/6 SID:43 PID:835/1091 Spanish. New SID for Bethel Television on 3875.00MHz, pol.H FEC:3/5 SR:3750: SID:60248 ( PID:529[MPEG-4]/530 Spanish - Clear). New PID for Bethel Television: PID:1101[MPEG-4]/1102 English SID:12 (3729.00MHz, pol.L SR:16832 FEC:3/5 - Clear). A new channel has started in DVB-S Clear: Bethel Television (Peru) on 10815.08MHz, pol.H SR:27485 FEC:5/6 SID:43 PID:835/1091 English. A new channel has started in DVB-S Clear: Bethel Television (Peru) on 10891.80MHz, pol.H SR:27500 FEC:5/6 SID:5 PID:517/1285. New SID for Bethel Television on 3729.00MHz, pol.L FEC:3/5 SR:16832: SID:12 ( PID:623[MPEG-4]/723 English - Clear). A new channel has started in DVB-S2 Clear: Bethel Television (Peru) on 3729.00MHz, pol.L SR:16832 FEC:3/5 SID:6 PID:37[MPEG-4]/38 English. A new channel has started in DVB-S2 Clear: Bethel Television (Peru) on 3729.00MHz, pol.L SR:16832 FEC:3/5 SID:3 PID:613/4112 English. New FEC for Bethel Television on 10891.80MHz, pol.H: FEC:5/6 ( SR:27500 SID:5 PID:517/1285 English - Clear). A new channel has started in DVB-S BISS: Bethel Television (Peru) on 11200.00MHz, pol.V SR:27500 FEC:5/6 SID:4890 PID:2090/3090 English. A new channel has started in DVB-S Clear: Bethel Television (Peru) on 10891.80MHz, pol.H SR:27500 FEC:3/4 SID:5 PID:517/1285 English. A new channel has started in DVB-S Clear: Bethel Television (Peru) on 10891.80MHz, pol.H SR:27500 FEC:3/4 SID:5 PID:517/1285. A new channel has started in DVB-S2 Clear: Bethel Television (Peru) on 3875.00MHz, pol.H SR:3750 FEC:3/5 SID:257 PID:4385[MPEG-4]/4387 Spanish. New frequency for Bethel Television: 12149.00MHz, pol.V (DVB-S SR:27500 FEC:3/4 SID:7276 PID:420/421 Spanish- Clear). Bethel Television is back on 11407.00MHz, pol.V SR:27500 FEC:3/4 SID:15431 after a break ( PID:535/536 Spanish - Clear). Bethel Television is back on 12111.00MHz, pol.V SR:27500 FEC:3/4 SID:721 after a break ( PID:360/361 Spanish - Clear). New frequency for Bethel Television: 11407.00MHz, pol.V (DVB-S SR:27500 FEC:3/4 SID:15431 PID:535/536 Spanish- Clear). New frequency for Bethel Television: 12111.00MHz, pol.V (DVB-S SR:27500 FEC:3/4 SID:721 PID:360/361 Spanish- Clear). New frequency for Bethel Television: 11355.00MHz, pol.H (DVB-S SR:11781 FEC:7/8 SID:15431 PID:535/536 Spanish- Clear). Bethel Television switched to Hot Bird 13C satellite at 11411.00MHz, pol.H (DVB-S , 11411.00MHz, pol.H SR:27500 FEC:5/6 PID:2931/2932 Spanish). New FEC for Bethel Television on 11387.00MHz, pol.H: FEC:7/8 ( SR:27500 SID:14842 PID:535/536 Spanish - Clear). A new channel has started in DVB-S Clear: Bethel Television (Peru) on 11387.00MHz, pol.H SR:27500 FEC:3/4 SID:14842 PID:535/536 Spanish,537. Bethel Television (Peru) broadcasts in DVB-S Clear on 11411.00MHz, pol.H SR:27500 FEC:5/6 SID:14212 PID:2931/2932 Portuguese. A new channel has started in DVB-S Clear: Bethel Television (Peru) on 11346.00MHz, pol.H SR:27500 FEC:2/3 SID:6101 PID:6107/6108 Spanish. New frequency for Bethel Television: 11240.00MHz, pol.V (DVB-S SR:27500 FEC:3/4 SID:13814 PID:5701/5702 Spanish- Clear). New PID for Bethel Television: PID:5701/5702 Spanish SID:13814 (11242.00MHz, pol.V SR:27500 FEC:3/4 - Clear). New PID for Bethel Television: PID:2501/2502 Spanish SID:13814 (11242.00MHz, pol.V SR:27500 FEC:3/4 - Clear). New frequency for Bethel Television: 11242.00MHz, pol.V (DVB-S SR:27500 FEC:3/4 SID:13814 PID:5701/5702 Spanish- Clear). Bethel Television has left 11200.00MHz, pol.V (DVB-S SID:4733 PID:413/414 Spanish), it is no longer transmitted by satellite in Europe. Bethel Television is back on 11200.00MHz, pol.V SR:27500 FEC:5/6 SID:4733 after a break ( PID:413/414 Spanish - Clear). A testcard identified Bethel Television has started in Clear on 11200.00MHz, pol.V SR:27500 FEC:5/6 SID:4733 PID:413/414 Spanish. 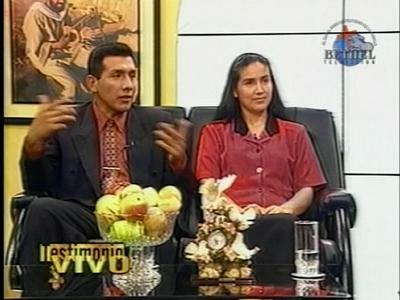 Bethel Television (Peru) broadcasts in DVB-S Clear on 11200.00MHz, pol.V SR:27500 FEC:5/6 SID:4733 PID:413/414 Spanish. Olisat: Bethel Television has left 11342.00MHz, pol.H (DVB-S SID:8405 PID:1037/1038 Spanish), it is no longer transmitted by satellite in Europe. Olisat: Bethel Television is back on 11342.00MHz, pol.H SR:27500 FEC:2/3 SID:8405 after a break ( PID:1037/1038 Spanish - Clear). Olisat: Bethel Television is back on 11304.00MHz, pol.H SR:27500 FEC:3/4 SID:8405 after a break ( PID:1037/1038 Spanish - Clear). Olisat: Bethel Television has left 11304.00MHz, pol.H (DVB-S SID:8405 PID:1037/1038 Spanish), it is no longer transmitted by satellite in Europe. Olisat: A new channel has started in DVB-S Clear: Bethel Television (Peru) on 11304.00MHz, pol.H SR:27500 FEC:3/4 SID:8405 PID:1037/1038 Spanish.